Heat oven to 425°F. Prick potatoes with fork; place in 1-gallon resealable food-storage plastic bag. Add oil and kosher salt; seal bag and turn to coat potatoes. Place potatoes on cookie sheet. Bake 1 hour or until tender. Cool. Reduce oven temperature to 350°F. Cut thin slice off top of each potato; discard. Scoop pulp into large bowl, leaving shells intact. Add cream cheese, butter and milk to pulp in bowl; mash with potato masher or electric mixer on low speed. Stir in cheese, bacon, onions, table salt and pepper. Spoon into potato shells. Return to cookie sheet. Bake 30 minutes or until thoroughly heated. 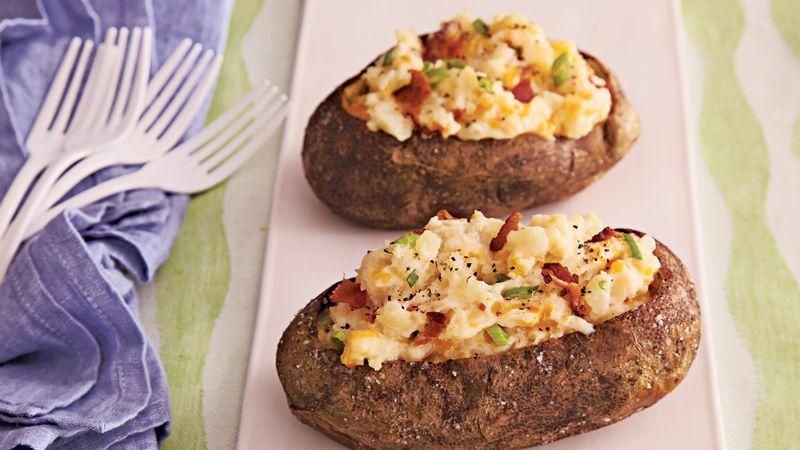 To Freeze: Wrap each stuffed potato in heavy-duty foil; freeze in resealable freezer plastic bag up to 1 month. To reheat, place unwrapped frozen potatoes on cookie sheet. Bake at 350°F for 1 hour.